A wildfire has threatened a southern California neighbourhood, destroying at least four homes, threatening dozens more and scorching a building at a winery owned by media mogul Rupert Murdoch. The so-called Skirball Fire, which erupted early on Wednesday is the latest in a rash of major blazes fuelled by hot, dry Santa Ana winds, had burned about 150 acres near large estates in the Bel-Air neighbourhood of Los Angeles by early afternoon. Firefighters are battling to save multi-million-dollar homes in the path of the flames, which also forced the closure of the San Diego 405 Freeway in both directions. The fire in the area south of scenic Mulholland Drive and north of Sunset Boulevard is just one of several major out-of-control brush fires that have sprung up in southern California since Monday, when Santa Ana wind conditions set in. 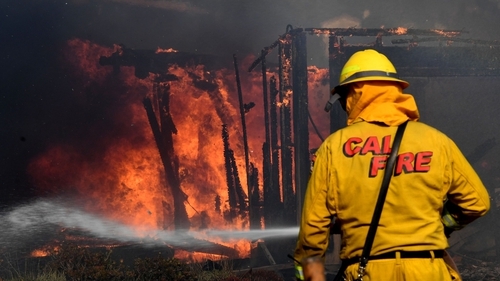 In Ventura, some 80km northwest of Los Angeles, more than 1,000 firefighters battled the largest, the Thomas Fire, which has already destroyed more than 150 homes and threatened thousands more. The blaze has charred more than 65,000 acres in Ventura and its foothills, they said. The entirely uncontained blaze was whipped by intensifying, dry Santa Ana winds blowing westward from the California desert. Gusts were forecast to top out at 115 km/h and remain strong through the week. California Governor Jerry Brown declared a state of emergency yesterday, freeing state funds and resources to assist firefighters. The Federal Emergency Management Agency said it approved grants to help cover the cost of emergency work for the Thomas Fire and two others. President Donald Trump said his thoughts and prayers were with everyone in the path of the wildfires. "I encourage everyone to heed the advice and orders of local and state officials," Mr Trump wrote on Twitter. "THANK YOU to all First Responders for your incredible work!" In the San Fernando Valley north of Los Angeles, the Creek Fire destroyed at least 30 homes, blackened more than 11,000 acres and forced the evacuation of 2,500 homes and a convalescent homd north of Interstate 210 yesterday. Three firefighters were injured and hospitalised in stable condition, the Los Angeles Fire Department said.